The Best Glass Door Supplier in Phoenix! SR Windows & Glass offers a full range of custom glass doors and sliding glass doors for your home. Did your glass door break or your sliding glass door seal fail? We offer glass door replacement and sliding glass door repair in the greater Phoenix area. This is a type of door that opens by sliding on rails often parallel to the wall. 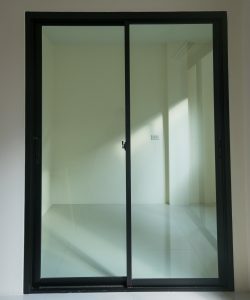 Such doors come in standard sizes but can be custom made to suit client needs. They are available in different thickness for sound proofing and natural light control. When the glass is damaged the doors can be replaced with a frame structure. 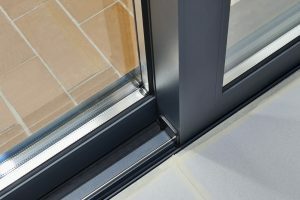 In case of cracks, chips, breakage or seal failure, the window glass may be replaced with another insulated glass unit. Like other dual pane windows, a sliding glass door is made with a dual pane glass unit, however, the glass is tempered because it interacts directly with humans. SR Windows & Glass can also replace the rollers on your sliding glass door to restore smooth movement of the slider. Glass doors function like regular doors with the exception of using tempered glass inside the door frame, or, in the case of a frameless glass door, the entire door is made of tempered safety glass. They are typically 0.5 inches thick for enhanced strength. In case of extreme impact the glass component of the door will break into tiny pieces meaning that complete replacement must be done as the only remedy. However, the hinge and hardware systems can be reused if they are still in good condition. Glass exterior doors and interior doors create a unique look while maintaining the security of the home. We use only the highest quality tempered glass and hardware to increase the safety of the door. We offer emergency glass door replacement if an exterior door is shattered or broken. The use of tempered glass in construction, cooking, mobile devices and design of household items is a testament to the popularity and benefits of the material. Tempered glass is basically glass that has been taken through a thermal or chemical process to ensure that it becomes tougher than the regular type of glass. Tempering of glass puts the exterior surface of the glass into compression while ensuring that the interior is in tension. The effect of the manufacturing process is that the glass will become extremely hard and difficult to destroy. When tempered glass does break, it shatters into hundreds of tiny nodules of glass that are less harmful to humans and pets. For this reason, building codes specify that any glass doors must be made with tempered glass. As a result of the qualities of this material it has become a popular choice for construction of exterior and interior glass doors. It can also be used in the design of windows, bathroom partitions and other types of interior decorations. Durability – as a result of the strict process of creating this material its chemical composition is altered. This allows the glass to remain in good condition for a long period. When properly maintained buildings that are constructed using the material will remain in good shape for over ten years. Enhances beauty – a house is valued depending on its features and beauty. Tempered glass is known to enhance the general beauty of any building that incorporates it. This means property owners are able to boost the value of their own homes and make more profits by simply taking advantage of the material. Acts as a security feature – few materials are able to ensure the security of a building without compromising its beauty. Tempered glass is quite strong and difficult to penetrate making it an ideal choice for construction of tough exterior glass doors that are able to prevent thieves or malicious people from accessing the inside of the building. Allows for natural light – one of the things that must be considered when building is energy saving. This type of glass allows for natural light from the sun to penetrate and illuminate the interior parts of the building. Occupants of the building do not have to worry about making provisions for artificial lighting during the day. It boosts safety – the safety of the people around the building is an important factor to consider. In case of an accident or unfortunate incident regular glass is likely to shatter into sharp pieces that can become hazardous. Tempered glass on the other hand does not shatter but instead breaks into small, circular pieces that are less likely to cause harm and is used for applications where humans come in frequent contact such as table top glass. Exceptional communications – the last thing you want is to try and get sliding glass door repair services only to realize that the provider is unreachable. This company is accessible through multiple channels including social media, telephone, live chats and email. Experience – having been established in 2011 this company has been actively providing sliding glass door replacement and other repair services for a variety of clients. Throughout this time the company has recruited some of the most talented staff and has come up with the most innovative solutions to different situations. Affordability – unlike other glass companies in Phoenix, Arizona, SR Windows $ Glass is more in touch with the needs of their client. Pricing is done after careful consideration of the application of the glass and hours of work needed to complete the installation. A company representative will explain how the amount is arrived at making the client rest assured of quality services at an affordable rate. Guaranteed results – once a client hires SR Windows & Glass they are given a comprehensive warranty that takes care of workmanship and materials. The warranty is an assurance that the company is committed to providing quality services for every project undertaken. Call us at (602) 534-3030 or complete an online quote form to get your next glass door project started.